Thousands of refugees fleeing the offensive by the army have poured across the lawless border into ramshackle camps on rugged hills in Afghanistan, stirring unease that Taliban militants may be hiding among them, reported a foreign news outfit. The mass departures over the porous border, which many in any case do not recognise, mark a change. For the first time in more than 30 years beleaguered residents are escaping into Afghanistan and not out of it, an irony not lost on local officials or refugee agencies. Authorities in Khost province are offering a warm welcome and what little they have to shelter the newcomers. But intelligence officers and the army are uneasy — some refugees from North Waziristan province could be militants of the Tehreek-i-Taliban Pakistan (TTP), the target of operation Zarb-iAzb. “These communities for decades have been the ones benefiting from the support of tribal communities in North Waziristan when they had to flee,” said Bo Shack, the top official in Afghanistan of the UN High Commissioner for Refugees. “Today they want to provide these families with equal help.” Refugees poured over the border in the other direction after Soviet troops invaded Afghanistan in 1979. More followed after Moscow’s pullout a decade later sparked mass disorder and still more fled after Afghanistan’s own Taliban took power in 1996. Some 3.8 million Afghans have returned to Afghanistan since the Taliban were ousted by a US-led coalition of forces in 2001, while 1.6 million remain there as refugees. The TTP is stronger and more audacious but with few aims in common with their Afghan brethren, last month they attacked Karachi airport. The military, weary of negotiations, told residents in the Taliban’s Waziristan stronghold to get out in advance of a crackdown. A two-week bombing campaign gave way to a ground offensive. 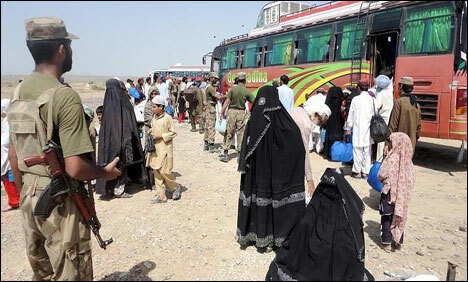 Pakistani officials say all civilians have left and anyone still there will be classed as a militant. The governor of Khost province applauded the hospitality of Afghan border villages last week at a gathering of Afghan officials and UN representatives at the refugee camps. Hundreds of white UN tents extend across rolling terrain dotted with sparse vegetation, with refugees putting up colourful drapes to create makeshift courtyards and a modicum of privacy. The UN said around 77,000 are in Khost. Ration packages stacked in tents are, like everything else, covered in dust. Children run everywhere, with toddlers scratching about in the dirt like hens. Mothers look on from shade, some in patterned headscarves, while others drift across the camp in black head-to-toe burqas.